All of these lively characters are the creations of Sandy High School art teacher Dan Shanklin's students. "I love getting out in Sandy and doing stuff I enjoy," junior Amanda Hansen told The Post. 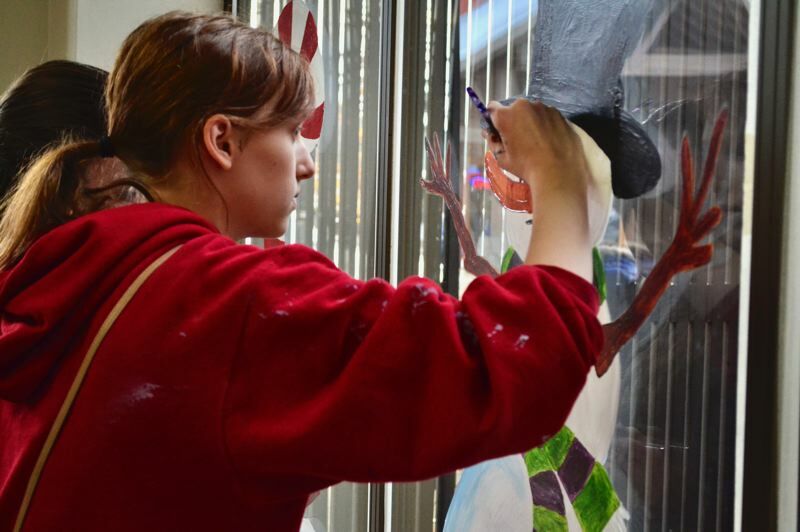 From 9:30 a.m. to 3 p.m. Friday, Nov. 30, Shanklin's aspiring artists took to the streets to paint the windows of the town's businesses in holiday cheer. 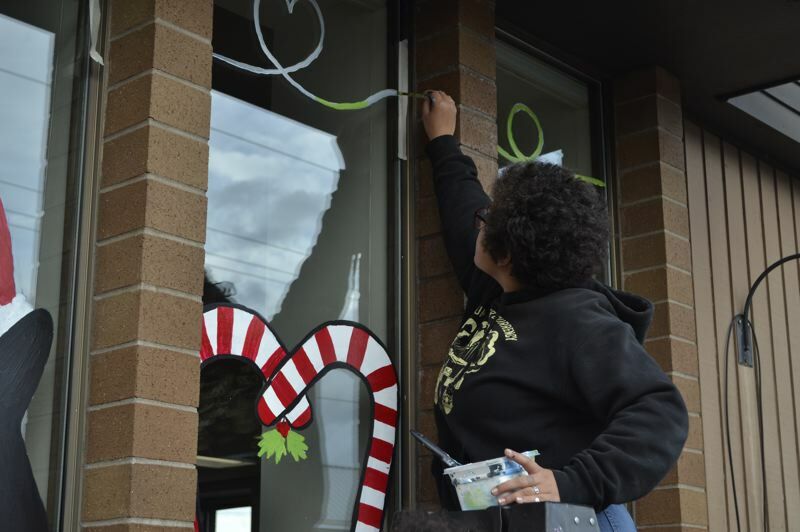 Among those who lent their storefronts as a canvas were Clackamas County Bank, the Sandy Public Library, the Sandy Community Center, ACE Hardware, Mt. Hood Cleaners and the Sandy Fire Department. "Sandy's a great place and we've always had the support of these businesses," Shanklin said. "I think it's about community. The kids love it." Shanklin told the story from a few winters ago, saying the sign at the bank read 16 degrees, "the paint was freezing in the trays and gelling on the windows, but (the kids) were still having fun." "I like that you can do this with your peers and kind of have fun doing it," junior Eboni Topich said. 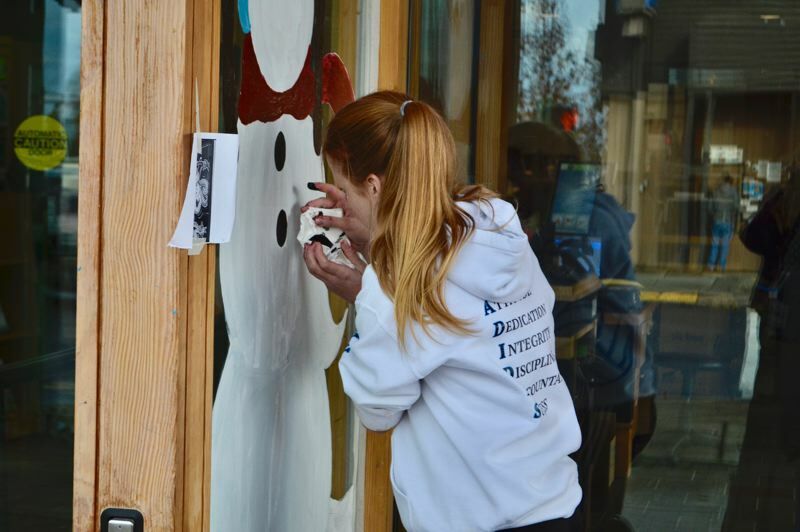 "I like the festivity and how the businesses like to decorate," noted junior Ayaunna Claus. Besides giving students experience outside of the classroom, the tradition also acts as a fundraiser for the art department. The businesses help fund the purchase of art supplies and the end-of-the-year student art show. "Any time we can help our local schools in any manner, we're going to be there," Clackamas County Bank President Cathy Stuchlik said. "They really do a phenomenal job. We have such great local talent."